OMAHA — Dec. 25, 2017 — In 2010, a young, talented and energetic redhead named Kelsey Schwenker joined American Midwest Ballet as one of the very first apprentices in the company’s inaugural season. Since that time, Kelsey has danced in nearly every scene in numerous roles to almost all of the music in American Midwest Ballet’s annual productions of The Nutcracker. 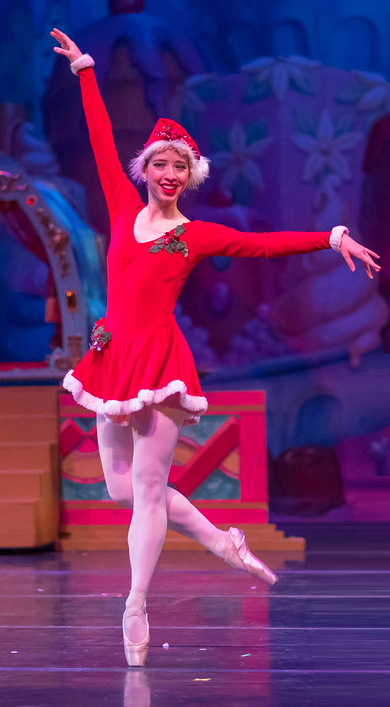 That is not even including all of the years she danced as a student in Colorado — making this her 17th year of dancing in this holiday classic. Round two of The Nutcracker is right around the corner as Kelsey prepares to dance in Nutcracker on the Indian River at Vero Beach, Florida later this week. What roles are you performing in The Nutcracker tour? In Vero’s Nutcracker I am Mrs. Sizeable and a gopher tortoise. In act one, Ryan [Christopher] is my stage husband. We have four unruly teenage children who won’t leave us alone and we are simply exhausted traveling through Grand Central Station for our Christmas vacation. In act two Erika [Overturff] and I dance as gopher tortoises to the typical Chinese divertissement music. I’m excited to do another interpretation of this classic story! How are you celebrating the holiday in between Nutcrackers this year? This year I didn’t want to spend my whole vacation traveling, so I decided to spend Christmas in Omaha with my boyfriend and help him dogsit! We will see friends and get some relaxation time together. Many members of my extended family live on the East coast in Florida, Delaware and New York. I have a fun group of aunts, uncles and cousins coming to the show, some of who have never seen me dance as a professional! I’m excited that this opportunity can bring together family that I haven’t seen for years. What is the best thing that has happened to you this season? My little jazz and musical theater heart was so tremendously happy to learn from Ann Reinking and Gary Chryst this fall! I felt so fortunate to have that opportunity and still almost can’t believe that it happened!